If you’re living in or visiting New York City this summer, you’ll want to explore new neighborhoods, eat amazing food, and spend some quality time outside. To accomplish all of that in one day, head to Williamsburg, Brooklyn. Easily accesible from Manhattan, there’s no excuse not to get off the island and spend a day on the other side of the East River. 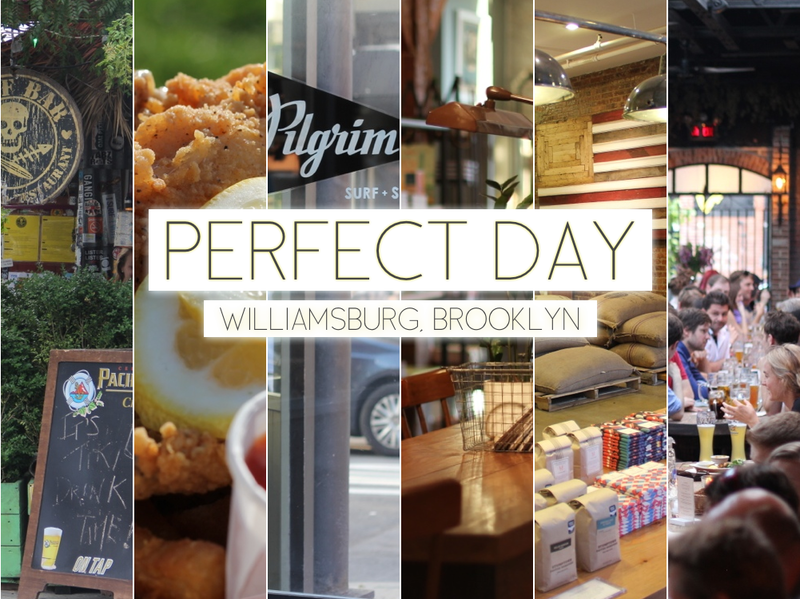 I recently spent a day in Williamsburg and put together this Perfect Day comprised of 6 stops to help you easily have an awesome day in Brooklyn. Following this list will take you to a sand covered beach bar, a food festival filled with unbelievable eats, a laid-back surf shop, the outpost of an ever evolving art project, a local chocolate maker, and a rowdy German biergarten. Enjoy! After a walk down Bedford Ave, turn on North 6th Street and head to Surf Bar to kick off your day with an early afternoon drink. 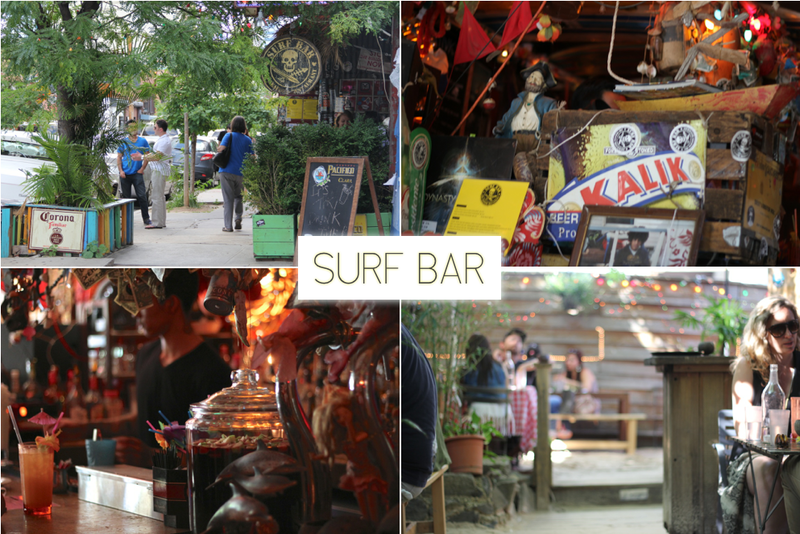 Walking into Surf Bar you’ll automatically be transported from the city to a Caribbean beach bar. With sand covering the floor and surf boards covering the ceiling, the only thing that will remind you you’re not far, far away is the mustache sporting and vintage clothes wearing crowd. Pretend you’re really in the Caribbean and order a Kalik or a drink you otherwise wouldn’t be caught dead drinking – maybe something with one of those paper umbrellas. 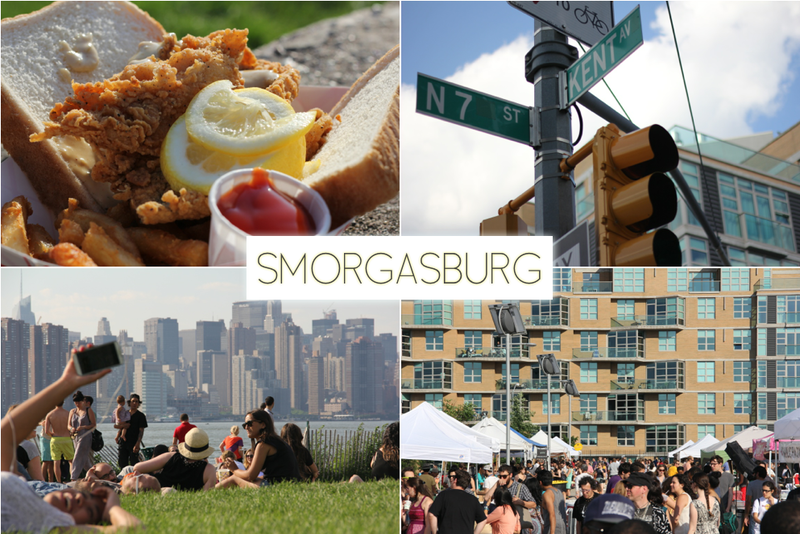 After building up a bit of a buzz and an appetite at Surf Bar, head over to Smorgasburg, an outdoor food festival set along the East River. Once a week on Saturdays between 11am and 6pm, purveyors of artisanal foods fill an empty lot and sell their prized creations. With options like fish and chips, gourmet s’mores, BBQ ribs, Mexican sandwiches, mini cheesecakes, and tacos, compile your own multi-course feast and set up shop on the nearby patch of grass. This day is for enjoying, so make sure to lay back, relax, eat, drink, and marvel at the Manhattan skyline. After drinking at Surf Bar and relaxing on the grass at Smorgasburg, chances are you’ll be in the summer spirit. To make sure you’re prepared for the season, stop by Pilgrim Surf + Supply for some new clothes perfect for the beach and casual summer nights. 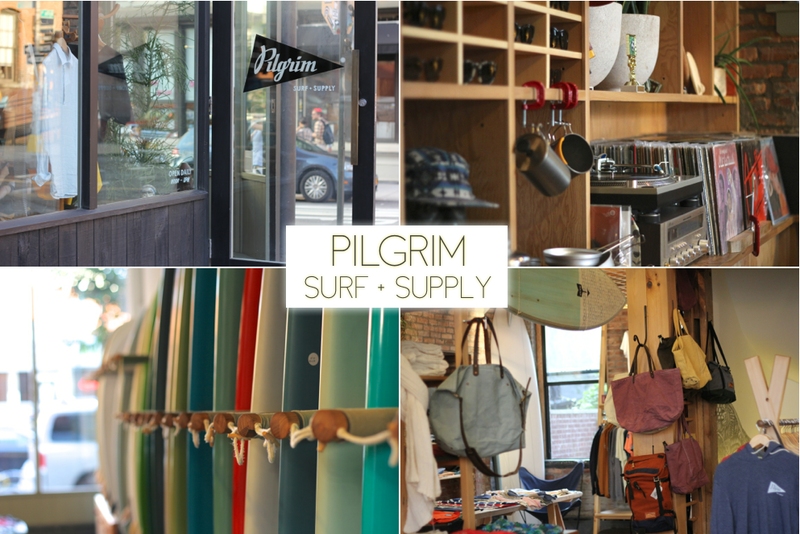 If you’re feeling extra ready to take on summer, Pilgrim has the surf boards and gear you’ll need to hit the waves. 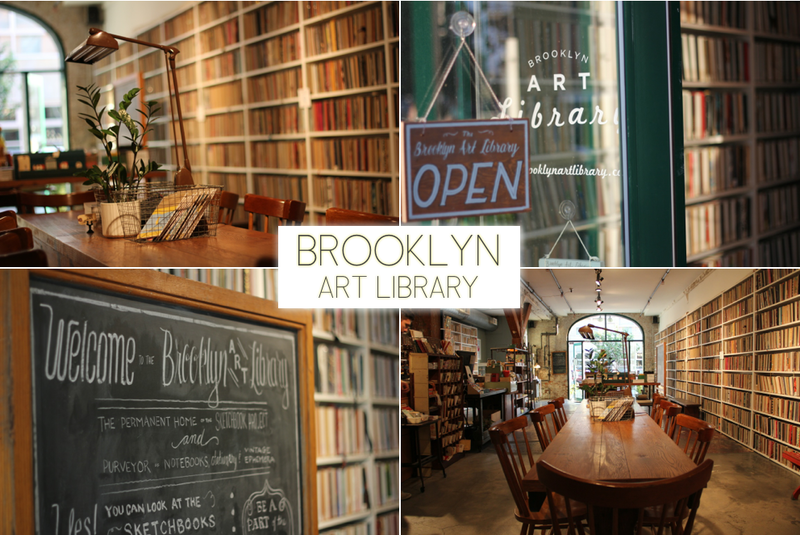 Walking into The Brooklyn Art Library, the permanent home of The Sketchbook Project, you’ll see thousands of little books on shelves lining the walls. These little books are actually sketch books created by different people from all walks of life and from all around the world. Just select the kind of sketch book you want to see on the store’s computer (ex. a sketch book about travel or one created by a person from Japan), and an employee will bring you a sketchbook matching your search criteria along with a random sketchbook. The whole experience is surprisingly intriguing. 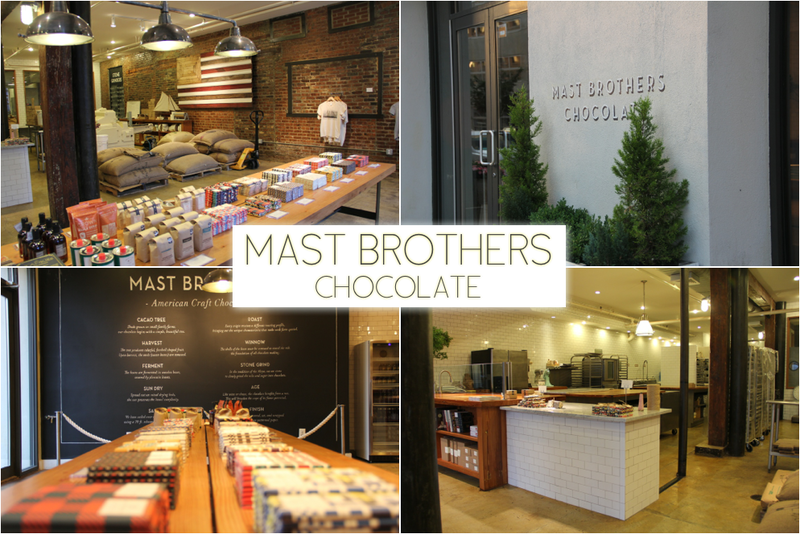 Assuming you didn’t fill up on dessert at Smorgasburg (and even if you did) it’s time for some incredible American made craft chocolate from Mast Brothers. Here at their Brooklyn factory and storefront, you can watch and learn about how they produce their high-quality chocolate bars. The sweet aroma, which you can smell from down the street when the front doors are open, is enough to make you never want to leave. Unfortunately they close at 7pm, so buy a bar or two and head a few doors down for the last stop of the day. You’ve drank, you’ve eaten, you’ve shopped, you’ve eaten again. Now it’s time to close out the day how it began at Surf Bar, with a drink. This time however, you’ll exchange drinks with tiny umbrellas for big mugs of beer at Radegast Hall and Biergarten. 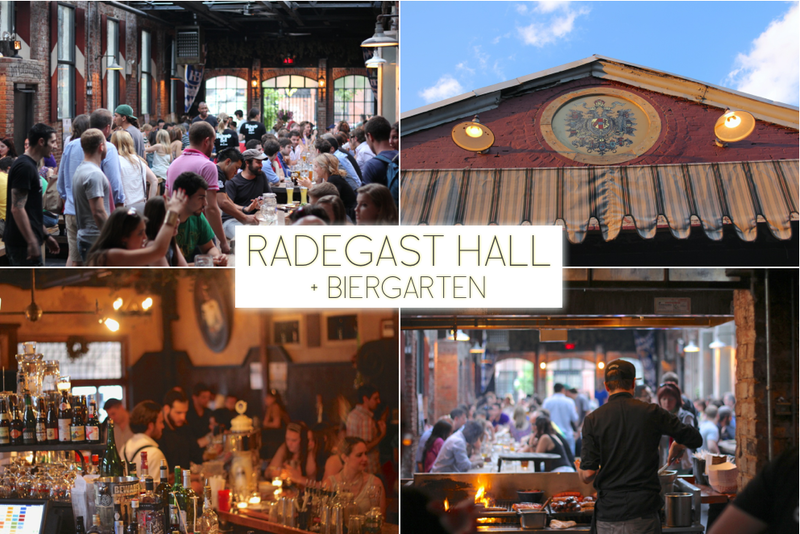 Lively and loud, Radegast Hall is the perfect spot to enjoy an evening of beer and socialize at the long communal picnic tables. If you find yourself hungry again, pull out your reserve Mast Brothers Chocolate bar or order one of Radegast’s fire-grilled sausages.